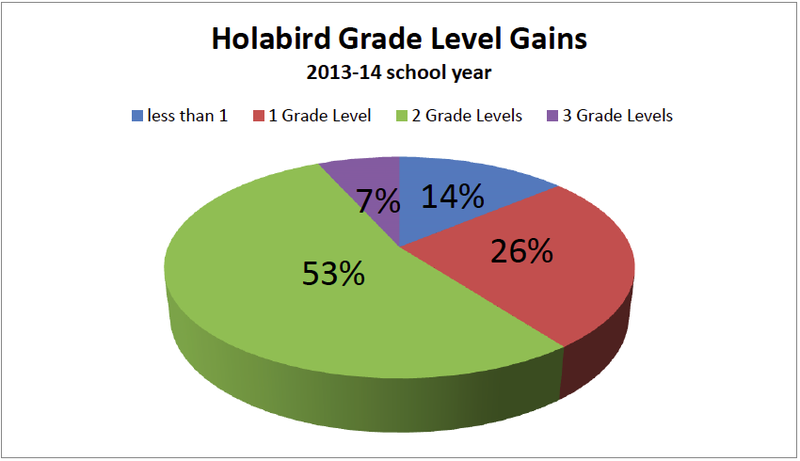 Holabird uses Ascend Math with 222 6th-8th graders scoring Basic on their state assessment. Prior to using Ascend, 97% of the students tested at least one grade below grade level, with about 70% of those students testing three or more grades below their current academic grade. Seventy-six percent are special education students. Goals include 100% of these students scoring Proficient or Advanced on the math portion of the MSA (Maryland State Assessment) and 100% increasing their grades for mathematics, specifically focusing on an average of 80% or higher. Number of students testing at 3rd grade level decreased by 92%. 6th graders testing at 5th grade level increased by 100%. 7th graders testing at 5th grade level increased 280%. 60% of students gained 2-3 grade levels in less than one school year. Sanders High School serves a 98% Native American student population. Many students come from homes with no running water, no electricity, and families that want to keep their children home to help tend to livestock and maintain native traditions. This is the first year Valley High School fully implemented Ascend Math to meet the math intervention needs of their students. Prior to using Ascend Math, 95% of intervention students achieved less than one grade level of improvement. All students were placed in level 2. 24% of the students achieved 4 grade levels of growth or more. 9% achieved 5 grade levels or more of growth. By the conclusion of the school year they are expected to reach a 10% mastery of level 8. Lakeside Christian School uses Ascend Math with 84 students in the 6th through 9th grades identified for RTI and in their elementary grades. By blending Ascend with a solid core curriculum, they are seeing all of their K through 2nd grade students hit grade level or higher. In some classes, all students are now working above grade level! 50% of Middle School students improved their level in Ascend. Of those, 15% improved two levels or more! When they started there were no students working at a level above their actual grade. As of 3/20/14, 20% of their students are working at a level above their actual grade. St. Pius X uses Ascend as part of the double-block Algebra I curriculum for students who need to fill math gaps. Students go to the lab 2-3 days per week, depending on what is happening in the Algebra I part of the class and how much oversight the students need while doing homework. 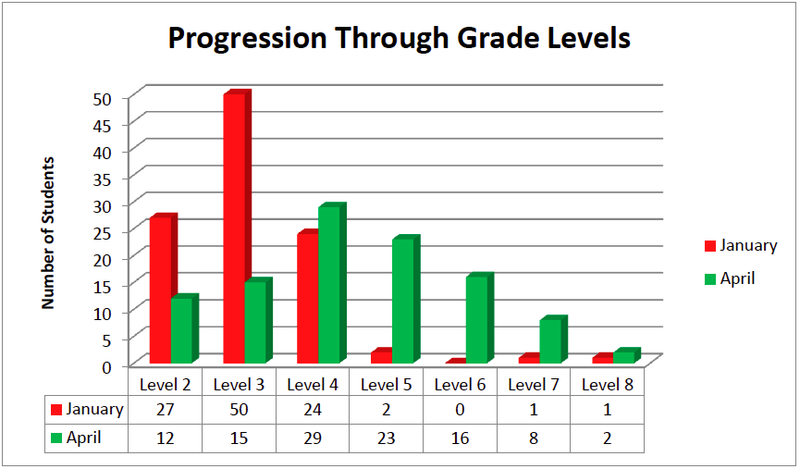 Fourteen of 19 students in one of two classes using Ascend have improved by at least one functional grade level. Those who have moved up have shown improvement in their algebra as well. Students at the lowest level have improved by 37.8%. Others improved from 13.3% to 46.7% in their post assessments. Central High School needed to better address the needs of their students who were significantly below grade level in math including special education students. Many of these students were so far below grade level, that they had little chance to be successful in their district adopted curriculum. In an effort to address the gaps in their skills, they began utilizing Ascend. Many of the students have demonstrated a changed attitude toward math, and school as a whole. Noticeable reduction in discipline incidents and improved attendance in math classes. 64% have achieved at least one grade level growth. Garside uses Ascend Math as their Tier 2 and 3 intervention in 6th through 8th grade both in their Math Fundamentals classes and after school Math Tutoring class. Their goal is to raise each student’s math ability so that they can achieve grade level success and be prepared for high school by the time they leave 8th grade. One teacher saw 19 out of 39 students improve by at least one letter grade with 5 students moving from an F to a C and another student from an F to a B. 11 out of 37 using Ascend after school improved at least one letter grade. Air Academy High School uses Ascend Math with 74 students including the special education students in their Significant Support Needs (SSN) Classroom. These students face a myriad of challenges related to their disabilities. All have been diagnosed with an intellectual disability, and many have also been diagnosed with an Autism Spectrum Disorder or with a Physical Disability. 45% of the SSN students have completed at least one level and attained an average of 90% or better on all objectives. 9% of the SSN students have completed two levels and have obtained an average of 905 or better on all objectives. 100% of all participating SSN student have demonstrated independent work completion on one or more objectives. Sanders is a Navajo Nation Public School whose students are among the poorest in the country. Their goal is for their students to achieve 50% or better passing rate on the AIMS (Arizona state test). Currently 210 students in the 6th through 8th grades use Ascend Math. One educator reports that students this year are on-task in math more than previous years. Their quarterly benchmark assessments are the best indicator of how students will do on the test. Educators at American Sunrise Learning Center turned to Ascend Math as a bilingual resource tool with enjoyable visual effects and colorful images for their ELL students. Up to 75% of the students in the Ascend program speak only Spanish and/or have limited English language skills. Ascend helps these students focus on developing and improving mathematical skills and achieving proficiency in math. Students are developing a positive attitude towards math and gaining self-confidence in working on math problems. Nine out of thirteen students bringing in their progress report cards have made A & B Honor roll the past semester. School Progress Report for these students shows a 19-23% gain from pre to post assessment. Wentzville South Middle School adopted the Ascend Math web-based program so that students could receive additional math instruction in a consistent, familiar environment. Their goal is to increase student skill levels in order to be able to do grade level curriculum while addressing any existing motivational issues. 88% of sixth grade students will be working just one level below grade level! Four out of the nine seventh graders are on level, and 55% are just one level below grade level. More important students are excited and gaining self-confidence. In the winter of 2014, Grimes’ students took the Winter NWEA test. The test results indicated that 27 of the 42 students (64%) in the 8th grade were not at grade level. Educators set out to close the achievement gap at Grimes/Fleming and improve their NWEA scores by the end of the year. This includes students with special needs, students in math MTSS (multi-tiered system of supports), and at-risk 6th and 8th grade students. Preliminary results after 6 weeks indicated tremendous improvement in Survey NWEA scores. Students testing at or above 50th percentile increased from 37.5% of students to 60.4% in the 6 months they used Ascend. Achieved the highest growth in their network of 25 schools during the second half of the year, the same period of time they used Ascend Math. Wentzville Middle School adopted Ascend to help the many students who were not achieving grade level. These students needed a prescriptive mathematics program that could be utilized outside of their regular math classroom. 120 students currently work on Ascend Math at an average of two hours a week. 67 students (56%) have grown by one grade level or more. 10% are now at grade level and one student has moved beyond grade level. 41% are now within reach, working at just one level below grade. Many of the students who have not yet achieved a grade level have only been in the program for just a few weeks. Educators at Cedar Elementary were looking for a way to provide a more individualized way to teach students who struggle in math and to challenge other students in the high ability classrooms. They use Ascend Math for both intervention and enrichment allowing students to work at their own pace. Intervention students saw an 18% improvement (Gain in Score) from pre to post test. 75% of intervention students gained 1 grade level or more, 25% gained 2 levels or more. Enrichment students posted an average Gain in Score of 19%. 57% of enrichment students gained 2 or more grade levels, 27% gained 3 grade levels. Greater Miami Adventist Academy uses Ascend Math to help 100 students in grades 6-8 fill math skill gaps. They are currently expanding use to the 5th grade. They integrate Ascend with the regular Math class to reinforce concepts, cover gaps never taught, and/or accelerate as far as individual students want. Students meet for Ascend once a week and work additionally on their own at home or school. Students report being more comfortable with math. IOWA Test ITBS scores increased 10%. Students who had completed grade level 8 at the end of 7th grade are considered to take Algebra I during 8th grade. Educators at Snowy Peaks found that many of their students came into the year below grade level and were unable to succeed in traditional Algebra and Geometry classes. Ascend Math enables them to tailor their math lessons to support the students’ specific learning gaps in order to help prepare them to succeed in a more traditional math class. Students grew by an average of 5.7 points on NWEA testing. To put that in perspective, a year’s worth of growth on that test is 3 points. Students using Ascend demonstrated nearly 2 years of growth in 4 months! Scores on objectives have increased by over 22%. Placebridge Academy is magnet school for the refugee students of Denver Public Schools – 80% of whom are English Language Learners. More than 90% are eligible for Free/Reduced Price Meals. They have used Ascend Math for three years to move as many students as possible in all grades closer to math proficiency. This year all 3rd graders were placed in the program to stop gaps early and provide a stronger foundation for them. Last year’s 3rd graders finished the year with an average Grade Equivalent (GE) of 3.4. This year’s 3rd graders have an average of 4.1. Last year’s 6th graders had an average GE of 5.3 in May. This year’s sixth graders have a score of 6.6. Students are entering each grade (grades 3-8) at a higher achievement level on the average. Fort Stockton is now in their fourth year using Ascend Math. When they started using Ascend, students were well below grade level. The school did not make AYP in math. The following year they were singled out for the highest math performance among middle and junior high schools in their region. They continue to see exceptional gains from their students. Passing rates on state tests continue to improve each year, from 75% to 82% to 88%. School progress reports show student improvement on pre and post-assessments of 13.2% to 36.3%. Educators at Burkholder were looking for a way to help students who are not successful in the general education classroom and who are not proficient in math. Ascend Math was chosen for its ability to meet the individual needs of each student. There goals are to increase student achievement in their general education classroom and on grade level standardized exams. 71% of students gained one grade level or more. 34% of students gained two or more grade levels. Results of periodic testing show students across all grades making significant progress.